When you are working out the areas of your divorce, one of the things you will have to decide on is who will be responsible for the marital debt. Both spouses may treat marital debt as a hot potato, trying to get rid of it by giving it to the other spouse as fast as possible. However, there are times when taking marital debt may be a good thing. In most cases, both spouses’ names will be on marital debt. In other words, both spouses will be legally obligated to pay that credit card as far as the credit card company is concerned. If you took out a joint car loan, you both will be responsible for that car loan. The creditors don’t care that your ex has agreed to pay the debt in a divorce decree. That means that if your ex does not pay a bill, you can end up being sued for it, having a car repossessed, or having a home foreclosed on. Even if none of that happens, it can result in significant and long-term damage to your credit, no matter what the court ordered or what your divorce agreement says. Yes, you can certainly take your ex back to court if he or she doesn’t pay a bill that he or she is supposed to pay. However, that process can be time consuming—your credit will surely be damaged by the time any court orders compliance, especially if your ex does not have the financial means to live up to his or her obligation. Because of this, it may be better to take marital debts, and make up for doing so by taking additional assets to make up for it. In other words, let’s assume the marital home will be sold, and the proceeds divided 50/50. Instead of doing that, it may be better to try to negotiate for taking 70% of the proceeds in return for accepting more of the marital debt. Or, asking for $200 more a month in alimony in return for taking more marital debt. You can do this with any asset. For example, you could ask for a greater portion of the value of a family business, or ask for a paid-off marital vehicle that you otherwise would have had to sell, or ask for a greater percentage of a retirement account. In this way, taking on more marital debt can give you the security of not leaving your credit to someone else. As long as the numbers work out, it may be better to be in more control of your financial affairs. 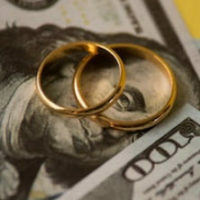 It may also may help you negotiate for some other benefit in your divorce that you would not have otherwise received. Of course, because this all must be negotiated, it is easier to make this work in the process of an agreed-to negotiated settlement agreement than leaving it in the hands of a judge. Our Tampa divorce attorneys at the Pawlowski//Mastrilli Law Group can help you negotiate a unique and individual divorce settlement, or help you take your divorce to trial if needed. Contact us today for more information.